If you’ve perused more than a couple recipes on my site you know I’m a humungous fan of coconut oil. I consume healthy fats liberally, coconut oil being one of my favorites. For variety and to incorporate more of the other healthy fats into my diet I’ve been using grass-fed butter in place of coconut oil in some of my smoothies. So far the results have been great. Butter blends well and smoothies with it leave me satiated for hours. Room temperature butter blends best. I made this smoothie with butter fresh out of the fridge and found a few small chunks in my smoothie. I actually kind of like a smoothie that requires a little chewing from fragments of nuts, coconut shreds/flakes, frozen fruit, greens, etc. While not the most important thing ever, soaking your nuts is advised. Soaking unlocks nutrition and reduces antinutrients. Soaked almonds also blend a little better in my experience. This smoothie is loaded with nutrition and definitely qualifies as a meal replacement, a tasty one at that. Enjoy! 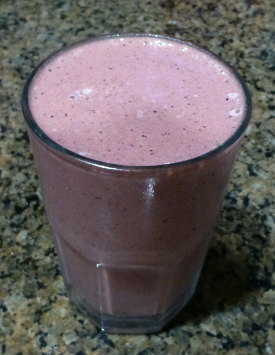 I’d love to know if you try this chocolate almond berry butter smoothie and what you thought. Please leave a comment below. Happy Blending! Lovely!! Fruity with a bit of the cacao and cinnamon… very very nice. Made it with only blueberries, and add on spinach. Tastes really good. will make again, thank you for sharing. This is my favorite smoothie recipe. I typically just use all blueberries, coconut oil, 1 cup greens and 1 TBLS both flax and maca. I love it when healthy foods meet tasty eating. Perfect! Thanks for sharing! Hi ,In my part of world berries are not easily available…I mean in the tropics…so what can I substitute? Try substituting any of the fruit that is local to you, Kez.